Twenty-eight New York City independent schools joined Dalton as we hosted the Seventh Annual Dalton Conference On April 22, 2017. The topic this year was Cultivating Racial Awareness and White Engagement. 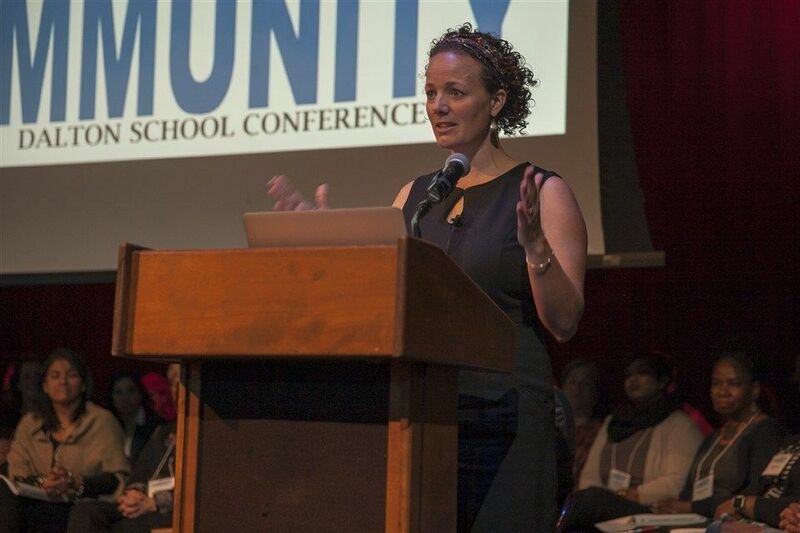 Dalton’s 2007 strategic plan called for the Trustees Community Life & Diversity Committee to create a New York City conference aimed at creating an inclusive independent school community. The inaugural conference, Creating a Generation of Inclusive Thinkers and Community Leaders, was held in 2011. Subsequent conferences focused on, School Transitions: The K-8 Experience, Shaping and Sustaining Safe Schools for LGBTQ Members, and Socioeconomics, Race • Privilege • Community Building, and Intersectionality. Head of School Ellen Stein welcomed attendees and introduced this year’s Conference with her own racial socialization story that set the tone for open conversations in the morning and afternoon. Dr. Ali Michael, the Director of K-12 Consulting and Professional Development at the Center for the Study of Race and Equity in Education at the University of Pennsylvania and the Director of the Race Institute for K-12 Educators, was the keynote and spoke about her own racial socialization, and asked attendees to think about their own personal narrative to spur on conversations for the morning breakout session by constituent groups. To view Dr. Michael’s PowerPoint presentation, click here. We extend our thanks to the over 60 Dalton volunteers who made the day possible. They included conference committee chair Casper Caldarola '77 along with the dedicated conference planning committee Rena Andoh ’93, Josh Bachrach, Michele Barakett, Kathy Chan, Roxanne Hsu Feldman, Amy Hikida, Emily Kasof, Claire Riccardi, Natalie Sanchez and Monique Vogelsang; the incredible facilitators and student volunteers. We would also like to thank the Stavros Niarchos Foundation for their support of the Conference and KIND for supplying the delicious snacks during the day. Dalton Head of School Ellen Stein introduces Dr. Ali Michael's keynote address on Cultivating Racial Awareness and White Engagement.